WAV file format contains audio sample data and optionally meta-data that describe the offsets of sample loops and cue points. The loop offsets are used by sampler software to generate a continuous sound, and the cue points mark the point in the sample data where the sound fades away after the note has been released. A WAV file "smpl" chunk will identify the byte sample offset of the start and end of the loop in the sound data. Using wavplay.b as a starting point I tried to loop a sampled sound. My sample data comes from Virtual Organ software GrandOrgue and the sample sets created for it. In this case I'm using the Burea Funeral Chapel sample set. My first test was simply to treat the sample as-is and loop the sound using the given offsets. This did not give good results with a notable noise as the data from the end of the sample joined with the beginning. I realized nearing the end of writing this post that the mistake I made was treating the offsets as counts of bytes instead of samples. The documentation I was using said they were bytes. But the early mistake caused me to develop the following, which turned out useful. You can try out my first experiment yourself with this lab's code and the included sample. The -s flag treats sample offsets as byte counts. The -n flag turns off finding the nearest zero. Audacity has a feature where you can move the selection boundary to the nearest zero in the waveform. In the picture above that would be the beginning, middle, or end of the waveform. Using this feature creates a more seamless transition between the end and start of the loop. However, the sound samples can be any point along the curve and there are very few actual zeroes in the sample data. 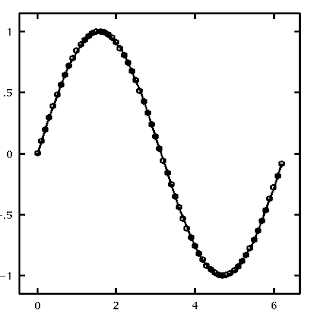 Instead I search for the crossing point of the y axis from negative to positive. The start and end samples must cross the zero-line going in the same direction. 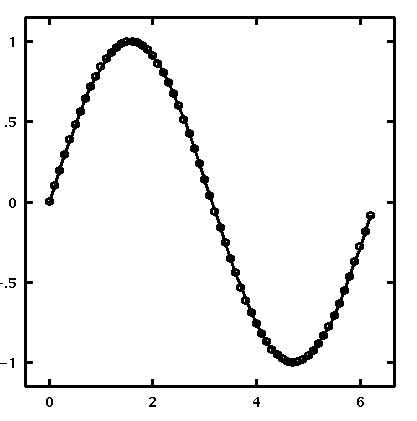 In the picture, the end of the graph is crossing the boundary in the upward direction and would join perfectly with the start or the curve forming a perfect loop. Play the sample without the -n flag to hear the difference. This works in most cases, but because the sample is in stereo the left and right channel might not be heading in the same direction at the same time. For the release cuepoint I follow a similar technique. I search for the zero crossing point where the data is rising. That will be where I jump to. But where I jump from could be anywhere in the sample data. So when the release event happens I also need to look for the nearest crossing point from where I am. This gives us the state transitions in the code for generating the sound data: START, LOOPING, RELEASING, RELEASE, and DONE. For the final experiment I tried to use the begin and end markers in the wav file as sample counts instead of bytes. In a 16bit, 2 channel WAV file there are 4 bytes for each stereo sample. This ended up making the best sounding loops. This is a lot of explanation for a little bit of code. I was hoping writing it out would help me figure out how to fix the looping to sound seamless in all cases, which it did, since I eventually tried the experiment of treating offsets as sample counts. But finding the nearest zero is still useful for jumping to the release cue point. The other way of making that join is by using a cross-fade, which I didn't try. The next step will be to load in a complete sample set, at least for one windchest, and implement midiplay's Instrument interface to plugin to midiplay. There has been a three and a half year gap in my posts to this blog. In that time I hadn't done any Limbo programming. I've used Acme as my editor everyday, but I was drifting towards using Notepad++ more often. In the past couple of months I've had the time to contemplate doing some hacking projects. I wanted to explore what I could do with Inferno for multimedia file types. This lab was the first thing I tackled in using Inferno again. I had to open up the Limbo paper to remember even some basic syntax. It bothered me that wm/view only displayed images using the Inferno 256 color map. Charon didn't have this limitation and I thought it had something to do with their respective image libraries. They don't use the same code. I extracted Charon's img.b code out into another view tool only to realize once I'd finished that the difference was not in the handling of JPEGs or PNGs but in the remap of the raw image to an Inferno image after the image was loaded. I changed wm/view to remap the graphic to 24bit color. Here are the results. There are a few other files in this lab. The modified wm/view to display JPEG and PNG in true color. A view tool similar to the Plan 9 view command. It uses the charon img.b library. 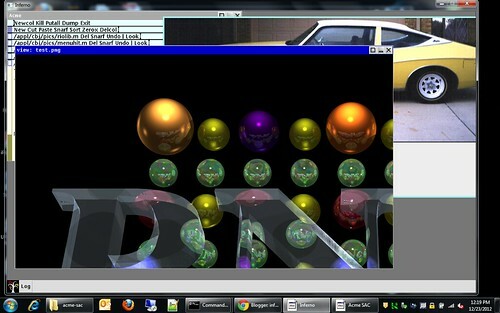 It also used the rioclient, riolib, and menuhit files included in this lab to give the appearance of a Rio window. You can see it in the upper left of the screenshot. Using this you can zoom in, pan, and fit to window. The zoom now works much better with true color than with the colormap. Similar to pics.b but doesn't use the charon img library. Also doesn't do the remap to 24bit color. wavplay plays a WAV file. It is merely a combination of the wav2iaf and the auplay commands already in Inferno. I have no audio in IAF format, but I am putting together 100s of GBs of wav files as I'm ripping my CD collection. Midiplay plays back MIDI files. It uses the synthesizer I described in lab 62 and the MIDI module from lab 73. The command takes only one argument, the path to the midi file. I've included one in the lab to demonstrate. Bind the audio device before using it. The synthesizer has 16 note polyphony. It uses three oscillators, one at the pitch, one at half pitch, one at double pitch. There is also a filter, two delays and a vibrato. The sample rate is 8000hz and there is one mono channel (MIDI channel events are ignored). It performs well enough to work on my laptop without JIT turned on. All the synthesizer parameters can only be tweaked from inside the code at the moment.